Moutiers Shops, Why go? What's there? Save money that's why! Moutiers is a small town at the base of the mountains that contains some of the most popular ski resorts in France. It is a industrial town which a Graphite factory is one of the large local employers. Many skiers use the shops in Moutiers to buy their weeks food (or as much of it as you can) before driving up to the resort at a vastly reduced price. Here at SkiGB we recommend this as most shops in the resorts are a lot more expensive and can be limited in their stock. We have listed the main shops in Moutiers that we think skiers will use most and where they are located on our map. Carrefour (previously called Hyper-Champion) is the main supermarket in the town, there are others but they are a lot smaller and holiday makers do not want to waste too much time in Moutiers going from one supermarket to the next. This shop sells almost everything! As well as the normal foods and household goods Moutiers Carrefour sells TVs (every skier must have one) to car equipment to clothes. What ever you need to buy this is the first port of call to try. 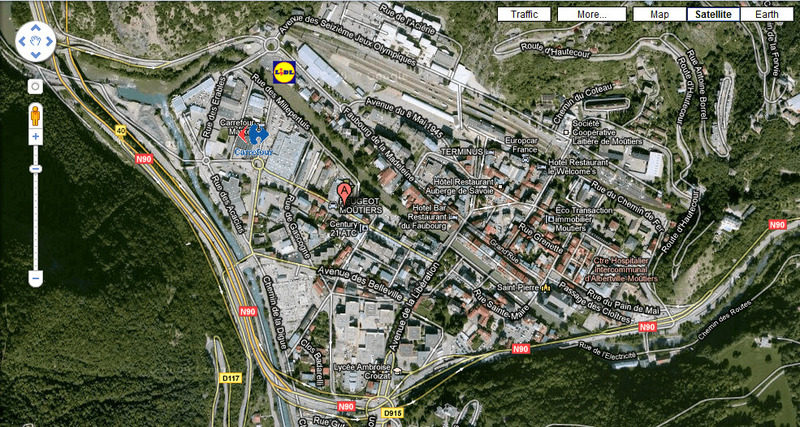 Lidl is also in Moutiers, this is basically the same as the Lidl’s in the UK.